Throughout this site we stress the importance of ensuring that you write a will, and that it is up to date and watertight. This is a vital task facing all those who wish for their estates and affairs to be dealt with after their death according to their intentions. But there is little point in writing a will if no one knows how to find it. 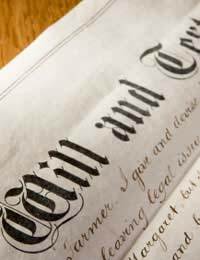 It is remarkably common for the family or other beneficiaries of a deceased individual’s estate to be completely unaware of the location of the will. While it may seem obvious to keep it in a safe place or lodge it with a solicitor, many people do not do this. As such, instances in which a will is difficult to find are common. This case study concerns Mrs Smith* whose great uncle recently died. Mrs Smith was the only surviving family member, and therefore took on responsibility for dealing with the deceased individual’s estate. She looked through drawers and filing cabinets in her great uncle’s home but could not find anything relevant. She knew the name of the bank with which he had an account and, as it was one of the few to still have a dedicated bank manager, suspected that he might have lodged a will there. Mrs Smith presumed that there must be a central register of wills that could be searched in circumstances like hers. Having performed a quick web search she found what appeared to be a national register of wills. “This seemed exactly what I was looking for – a big database of wills and trust documents.” In fact, though, this database did not fulfil her requirements. There are a number of ‘will registers’ that are actually just privately run companies that require individuals to submit their wills, or authorise their solicitors to do so. There is not currently any official, central database of wills or trust documents. By chance Mrs Smith eventually found some documents in her great uncle’s house on a solicitor’s headed notepaper. She called the solicitor and it turned out that they had written the man’s will. As can be seen, finding a will can be a difficult and time consuming process. As such, when writing your will you should always ensure that the relevant people know where it is. Lodging a copy with your solicitor is also a good idea, as this is the first place that many people will think to look. Think very carefully before using a ‘will register’; these are often not regulated and can be something of a waste of money.